In the hundreds of posts, emails, Reddit messages and Facebook responses over the homosexual issue in Tennessee and Georgia, many devout Christian Masons have expressed their personal religious viewpoints on the matter. I do not discount those deeply held beliefs, in spite of what some posters have alleged. I readily accept that their faith is incompatible with homosexuality, as well as co-habitation with someone who isn't a spouse. And yet, there are many Christian denominations that perform gay marriages, as well as ordaining gay clergy. Their faith is just as strong. Unfortunately, several posters over the last few days have simply declared these fellow Christians as "Biblically illiterate" or just plain wrong. A Brother from New York sent me a message today that brought to light an interesting twist that came about in his state back in 2011, when New York State was on the verge of its own new law legalizing gay marriage. For many years, the Episcopal Church where I reside (Diocese of Long Island, in NY) has required heterosexual members of the clergy to marry if they wanted to co-habitate on Church property (in a parish house for example). The rule did not apply to gay clergy (since they could not legally marry). However, when New York State allowed gay marriage, the double-standard was done away with... Now, the rule applies to all clergy equally... both heterosexual and gay clergy must marry if they wish to co-habitate with someone on church property. Think about that for a moment... a religious diocese (belonging to one of the more "mainstream" of mainstream Christian denominations) now REQUIRES gay men to marry (all-be-it in in limited situations). It is certainly possible that one of these (now married) gay clergymen is a member a Tennessee Lodge. If so, the Grand Lodge of Tennessee could be expelling a man for actually following his Christian faith... for doing what his Bishop tells him is the moral thing to do. In the wake of gay marriage soon becoming a legal institution in the state of New York, the Episcopal Bishop of Long Island, has ordered that homosexual priests wed their partners. Long Island Episcopal Bishop Lawrence Provenzano has put his foot down against gay clergy who residing in homosexual relationships, and has given a nine month deadline for them to either get married or stop living together, according to the News Observer. “I need to be mindful that the church has always asked people to live in committed monogamous, faithful relationships. I won’t allow heterosexual clergy to live in a rectory or church housing without the benefit of marriage. When one puts it in that context, then you see how it all begins to make sense,” said Provenzano. Reverend Christopher Hofer, pastor of the Episcopal Church of St. Jude agrees with Provenzano, “I think his statement was not only fair, but beyond generous. It gives people time, acknowledging that there’s a financial component involved and recognizing that some may not choose to live together. “Now that the state is recognizing civil marriage, we as priests, perhaps deacons too, who are in committed relationships, have a choice: we either live what we preach to become civilly married or we live apart,” he said. A Mason is oblig’d by his Tenure, to obey the moral Law ; and if he rightly understands the Art, he will never be a stupid Atheist, nor an irreligious Libertine. But though in ancient Times Masons were charg’d in every Country to be of the Religion of that Country or Nation, whatever it was, yet ’tis now thought more expedient only to oblige them to that Religion in which all Men agree, leaving their particular Opinions to themselves; that is, to be good Men and true, or Men of Honour and Honesty, by whatever Denominations or Persuasions they may be distinguish’d; whereby Masonry becomes the Center of Union, and the Means of conciliating true Friendship among Persons that must else have remain’d at a perpetual Distance. Many of the men who transformed Freemasonry from a labor union to a modern brotherhood during the Enlightenment were Deists. They believed that the Earth and stars were designed and created by a supreme entity, and that the universe operated like a giant clockwork mechanism. But those learned and visionary men largely didn't believe in Divine Intervention, virgin births, or a human God who walked the sands and hills of the Holy Land performing miracles. Nor did they believe that God gave a particular fig about the daily lives of each and every human being who believed in Him. These men pondered long and hard on their beliefs, approaching their religious philosophy as they approached the rest of the Liberal Arts and Sciences. As Masons, do we now cast these men and their philosophies aside when it suits our convenience, because their faith differed from our own? Are we to now turn our backs on our Brethren if they believe in transubstantiation and we don't? Or whether they believe in seven sacraments instead of two? What about our Jewish Brethren, from whose writings we draw our ritual ceremonies? How must they feel when the Grand Chaplain ends every prayer by saying, "In Jesus' name?" Or our Muslim Brethren, or Hindus, or the rest of the panoply of the world's religions, whose adherents we claim to welcome? Our humble rural lodge may not have any members of those faiths, but Freemasonry is a much bigger landscape beyond just what we see two Thursdays a month. Masonry was as close to a perfect template ever designed for an organization that was based on instilling brotherly love among disparate men from every walk of life, every religion, every political persuasion, who had very little in common with each other. In your own Masonic career, you have undoubtedly made friends with men you otherwise would never have met, never socialized with, never sat in church with, never have given a second thought to. That is what makes this fraternity unlike any other. But I have heard from dozens of good Masons who have given much of their time and treasure to it, who are now leaving because we have failed to live up to the promises we made to them when they joined. They feel like their Brothers have lied to them, and their leaders have refused to even listen to their grievances. The world is changing around us at a rapid pace, and I certainly understand the view that Masonry should be a cornerstone that remains steady through the ages. But when we misinterpret what makes up that cornerstone, we chip away at it and make it into something it was never supposed to be. No, the lodge is not a church, and we endanger it when we try to make it one. Bro. Chris, this is a superb essay that deserves wide attention. I, for one,have never respected those who quote Leviticus to curse homosexuality while serving barbecue plates in their polycotton blend aprons. Thank you for addressing this subject thoughtfully, Bro. Chris. I have offered my views on the entire matter largely from a social and political perspective elsewhere. I have not directly addressed the matter of belief in my remarks, largely because I take the view that Freemasonry should, like government, keep its nose out of religious matters. While I respect everyone's religious beliefs, I also come from a tradition that suggests politely, that if you do not wish to associate yourself with certain others, the onus is upon you to absent yourself rather than forcing your views upon the rest. Everyone's mileage may vary of course and that is only appropriate. While I may be possessed of strong views, I appreciate and value the measured commentary. We need more of that, not less. Chris, I'm really enjoying your transition from a Masonic news reporter into an opinion writer. Well spoken, brother. Heh. I'm afraid others aren't. But thanks, I appreciate it. I can only comment on this as an Episcopalian. I don't recall Jesus Christ casting out homosexuals (or prostitutes, thieves, or tax collectors. 'Nuff said. He didn't cast out sinners but he certainly admonished (or even whipped, in the case of the money changers) them and urged them to discontinue their sinful ways. So is that the modern day role of Christians, to act in His stead? Among other Christians? Yes (though I'd try to leave aside the whipping as much as possible). Jesus addresses the issue in Matthew 18. Paul does so in several letters, James towards the end of his book and Revelation at least obliquely. There may be more, but those come to mind. I would simply say in your own house or church, that's fine. But not in the lodge or grand lodge. If we are not to correct a wayward Mason, then why are there any masonic charges? Of course we follow the exact same role within the lodge, correcting a brother that runs afoul of masonic law. The disagreement is over what should be included in masonic law, not over whether or not we ought to correct someone. That's probably a better way to put it. Well said Chris. I will share this on a few Masonic FB pages. I trust you don't mind. It's hard not to just give up and quit. I know that a lot of the TN brothers weren't against allowing homosexuals, but they WERE adamantly against being forced into it. For myself, I know that quitting won't change anything. It will require brothers to stand up and fight for what's right. If everyone who disagrees quits, nothing will ever change. Chris, so very well put. You speak for the fraternity as well as anyone could ask. Kind of off subject, but something you mentioned made me think of it. You said that "our Hindu brethren...". 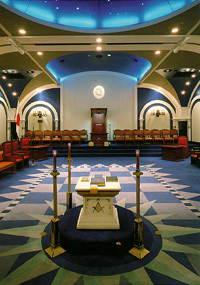 I had visited a California lodge on a trip that was doing a lodge walkabout for the new brothers. Being from "Ancient" Pennsylvania, it was extremely helpful for me as well. However, the WM made mention at one point that only MONOTHEISTIC individuals were able to become masons. Is there any truth to this? Is it a California rule, and if so does this apply under other GLs? Monotheism was (or is) the "traditional" view from within Freemasonry (Great Architect, not Architects). I think most places accept any spiritual belief now, but some may not. Well written Bro. Freemasonry is about looking beyond what separates us and embrasing each one to make him a better person. Perfectly describes the separation of the Church and Freemasonry.